For 20 years John Aitchison has been travelling the world to film wildlife for the BBC and other broadcasters, taking him to faraway places on every continent. 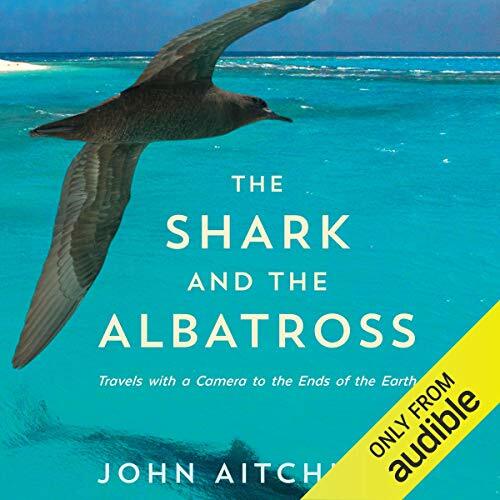 The Shark and the Albatross is the story of these journeys of discovery, of his encounters with animals and occasional enterprising individuals in remote and sometimes dangerous places. His destinations include the far north and the far south, expeditions to film for Frozen Planet and other natural history series, in Svalbard, Alaska, the remote Atlantic island of South Georgia, and the Antarctic. They also encompass wild places in India, China and the United States. In all, he finds and describes key moments in the lives of animals, among them polar bears and penguins, seals and whales, sharks and birds, and wolves and lynxes. He reveals what happens behind the scenes and beyond the camera. He explains the practicalities and challenges of the filming process and the problems of survival in perilous places. He records touching moments and dramatic incidents, some ending in success, others desperately sad. There are times when a hunted animal triumphs against the odds and others when, in spite of preparation for every outcome, disaster strikes. And, as the author shows in several incidents that combine nail-biting tension with hair-raising hilarity, disaster can strike for filmmakers too. This is natural history writing at its absolute best, evocative, informative and gripping from first to last. Spellbinding stories of wildlife film making. Beautiful and descriptive, this is an audio book to be savoured slowly, as the author transports you to far away places and films their wild inhabitants. Very well written and read. I really enjoyed this book, it has a lot of emotion, humour, and shows how passionate he is about the amazing animals he films. It provides an incredible perspective, hearing the stories behind the scenes of the shots I remember most from the BBC series. Truly an inspiring read. What did you love best about The Shark and the Albatross? The author is clearly a deeply caring and eloquent man. The entire book was difficult to put down. John Aitchison has a great voice for narration. Listening to the audiobook is the best relaxation therapy you could hope for. Let the amazing locations of described in the book wash over you as you follow the animal inhabitants through their incredible trials. Brilliant insight to wildlife and film-making. What did you like most about The Shark and the Albatross? Varied, interesting and well paced chapters. Inspiring descriptions and explanations. The author 'takes you' to some remote and amazing locations and describes the lives of the animals, birds and people (not just the subject of the film he's making). Highlights the hardships and challenges the film crew go through to get the iconic images we all remember, all without it ever becoming imposing. Provides details of behavior, environment and even some technical film-making details - but it's never too much. At the end of each chapter an update of the animals/birds situation provides further interest. Doesn't shy away from tackling the larger global questions wildlife film making often raises, but is never 'preachy'. All the animals and birds are well described and a broader picture of their lives and environments is given. The level of detail is perfect - enough to understand the locations yet still leaves room for your imagination. What does John Aitchison bring to the story that you wouldn’t experience if you had only read the book? It greatly added to the pleasure of the audiobook to know that Mr Aitchison was describing the locations and experiences he had himself undertaken. We all know his excellent film work, but to hear his excitement and enthusiasm about it is infectious and inspiring. Miles better than just reading words on a page. I also appreciated his subtle and underplayed humor throughout the book. No specific moment - I was moved and enthused by Mr Aitchisons descriptions of the animals and birds in their natural locations, and his appreciation of wildlife and nature in all its forms. I think this audiobook adds greatly to the films we all know. It has certainly inspired me to get out and appreciate the natural world and to understand, in a small way, the hardships and cost to family life film makers endure to bring wildlife films to our screens. Highly recommended. This is a fascinating insight into the dedication and intricacies of being one of the worlds best wildlife cameraman. The calm, thoughtful approach is borne out in the narration. This makes a wonderful antidote to a Dan Brown style pageturner. Try it and enjoy the contrast. The voice of the pro whos been there, seen it & brought back the the life we wish we had - dont miss it. Won't go to the ends of the earth to listen again. Nothing in particular. I enjoyed hearing the background to how he managed to capture the images of the different wildlife. What about John Aitchison’s performance did you like? I didn't like it so much. He's a quiet speaker so I often didn't hear full words and it was better speeded up. Not into films or photography so didn't get so much out of this book. am glad I tried it though. This book like so many others like it is a tale of casual cruelty some of it understandable and some not. All of it ought to be disapproved of but isn't. After all we don't like our privacy invaded do we? we close down whole newspapers because of an invasion of privacy. Yet we think nothing of invading the privacy of animals by going in to their homes, fitting radio collars, filming them and bending birds to ouw will jsut to watch them fly. Horse racing is another one. Yet how else might we understand how they live? Don't get me wrong I enjoyed this book though at times it was a bit too journalistic for my taste. I'e always been interested in wildlife. I suppose that's because I was brought up in the countryside but still slavery and there's no other word for the way we force animals to bend to our will when they ought to be wild such as falcons seems unnecessary. I do not include dogs in this. they, after all, have been domesticated over decades if not centuries. The book itself gives an insight in to animals in the wild and is extremely vivid in its portrayal of a variety of wildlife being fulmed as well as the surroundings. The narator though is very soft spoken so it's not always easy to hear what he's saying. I think if the book teaches us anythingt we didn't already know it's that no matter what we think of nature man and his need to progress will prevail even aththe expense and extinction of nature.